Last winter I renovated a new house. 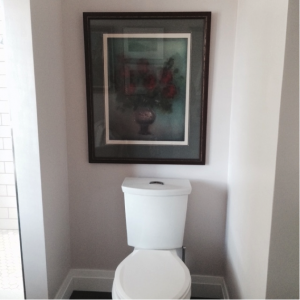 I wanted to do something different in my master bathroom. I was tired of white tiled floors. I still wanted white cabinets (shiny ones) but I wanted the floor to be a dark porcelain because the wood floors throughout the house were very dark oak. This became a colour problem for me because the wall colour I needed to choose would have to tie the warm brown floor into the cool white tiled shower and cabinets. Cool colours just didn’t work with that floor. One morning when the sun was shining into the bathroom I realised there was a definite reddish pink undertone in the tile. But I did not want pink on my bathroom walls and my husband certainly didn’t. It was when I was going through my little Style at Home fan deck from Beauti-Tone that I saw Japonica. Upon examination it almost looked greyish but next to my floor it looked like a greyish pink. It was so beautiful and my husband liked it too. 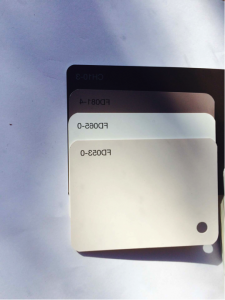 In my NCS colour atlas I found it on the page of pure red with a low saturation and high luminosity or value. This colour is almost ethereal and warm. It looks pinkish but it reads so many ways that I decided to call it a genderless pink. Here are pictures of the bathroom. You can see how the colour varies in the light. 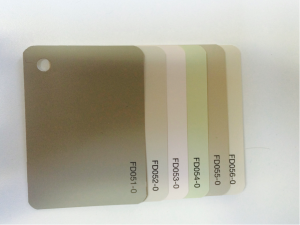 This is the colour palette for this bathroom. 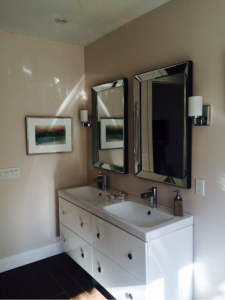 Dark brown floors, dark mauve towels, Japonica walls with true white cabinet and trim. Later on this last spring I was asked by a good friend if I would pick the colours for a drop in centre she had started for SOAAR, a group that develops programming for young autistic adults. Once this age group is finished school there are very few options. I knew that autistic children are very sensitive to colour and so I did a lot research on what would be the perfect choices. Pink was the hands down favourite. Now I knew a traditional pink would not go over well with parents because most of these young adults were male and so once again Japonica came to my rescue. When I first presented my palette the organizers were sceptical but once on the wall everyone agreed it was the perfect colour and so I named Japonica the genderless pink. Everyone likes it. Here are some palette ideas. 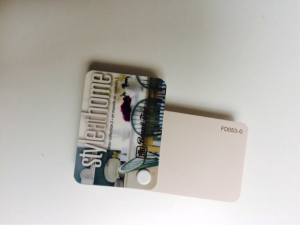 Style at Home has a beautiful fan deck that they put together for Beautitone Paint. Here is their colour palette that includes Japonica. This is a creamy white with Japonica, a green tan with Navy blue. 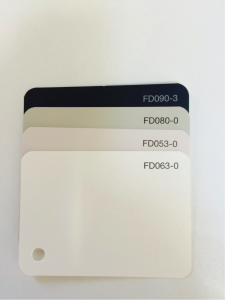 If you want help to pick the right colours, call me, Roz Kavander, 416-577-4944.